I might have walked into this movie lying to myself. See, before I sat down in my seat with a thirsting anticipation for this movie, I had convinced myself that I hadn’t seen the animated classic from 1991. However, I felt the biggest smile curl on my lips when I saw Emma Watson step outside of her home and the music started. In a moment, I felt myself regressing back to my youthful self, sitting around my cousins in the living room of my aunt’s house. I remembered how the song purchased my attention at that age and kept me entranced until the credits rolled. And even though I didn’t watch that movie often (which was the reason why I thought I hadn’t seen it), this movie allowed me to purchase a ticket on the train of nostalgia and I enjoyed every minute of the ride. 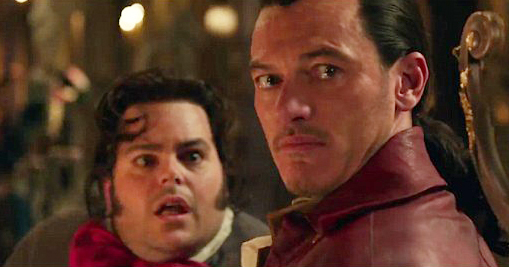 Beauty and the Beast is a live-action re-telling of the animated classic. The prince of a land has been condemned to take the form of a beast because of his selfishness. His only hope of breaking his curse of imprisonment in his home of not only himself but those who served him being the Beast finding true love. Fate gives him this opportunity when a young woman named Belle comes to save her father who had been imprisoned for thievery. Will our beast find redemption or be forever cursed? Remarkable. Utterly remarkable. It has hard to believe that these songs after nearly twenty-five years still hold the same if not more charm. They are exceptionally clever and moving and if you are lucky enough to know the songs, you will find yourself singing uncontrollably. The audience I was with was a mini choir and no one complained. I cannot stress how good the music was and I praise that cast for nailing it. Not only were they performed well, in my opinion, they injected a bit more humor than the original that wasn’t needed but appreciated. The music was awesome outside of one gripe. “Beauty and the Beast” when it was sung was a bit a jarring. Almost as if it was over-performed by Audra McDonald. (Her singing rubs me the wrong way. No offense.) Correct me please if it was always like that in the original and if not, tell me if you got the same vibe if you see the movie. (By the way, my favorite song is “Belle” with a close second being “Be Our Guest”.) However, as a person who greatly appreciates the score of a movie, this movie has a touching score that is worth listening outside of the movie. Beauty and the Beast is spectacle to watch. I have to say it was magic on the screen to watch these characters be portrayed by this more than stellar cast. Emma Watson. What can’t you say about her? Beautiful? Stunningly so. Actress? Perhaps I shouldn’t have asked that question. I mean it is really hard to take your eyes off of her. The way his expresses so much emotion with her eyes whenever she is angry or happy can have you falling head over heels for her. There is an enchanting aura about her that draws you in and her smile is infectious. The surprising thing that I learned about her is that she was a really lovely singing voice. She has personified Belle for all the little girls of this generation and without a doubt, she is someone I am proud to have them to look up to. The Beast, who is played Dan Stevens who some might recognize from his recent role in Legion as David Haller was great even though he was behind CGI. And though I enjoyed seeing the Beast on screen, I will admit that it took some adjusting to accept it. For me, it wasn’t long before it wasn’t an issue but I see that being a problem for some. Dan acting really shines through the CGI and can tell the amount of work that went into capturing his subtle nuances that bring the Beast to life. However, his singing though not bad was another thing that noticed wasn’t on the same level in certain songs. This is completely subjective so don’t let this deter you. I would be remiss not to mention how stunning the environments are in this movie. Honestly, I would have loved to visit the castle as it is the perfect envision of all castles that I picture in my mind. Wonderfully Gothic with gorgeous winter landscape. I could stay there forever and be perfectly content! Not to mention that the animation for all of the household items worked so well! Combined with the wonderful actors voicing them, I forgot at times they were CGI and highlighting this only makes the Beast stand out a bit more in contrast. Once again, it isn’t deal-breaking but it can remove from the experience at times. At least it did for me. All man, can you tell how excited I am about this movie? My anticipation and thoughts weren’t this high so I was impressed with what I got to see and how it made me feel. Movies are supposed to be our gateway away from reality. A moment’s reprieve in the monotony of life. An escape if you will. Like I said in my opening, this movie purchases the ticket for you and leads to your chair with confidence that you will love the ride. It is a perfect movie for the family and especially for anyone with has little girls. This retelling truly reminds you why this tale is as old as time and it will never be forgotten. I am looking to read your opinion of it this afternoon. I’m so excited about it!